…The family was preparing to celebrate Easter, cakes were being baked and eggs were painted with dye made from onion skins. A visiting artist was scratching the surface of the painted eggs with a needle and a little Ludmila was watching in awe at how Christ’s stunningly beautiful face was taking shape… That evening, the girl understood that artists hold power over the world. Pensile in hand, they could do anything. To be an artist was the best thing in the world! Ludmila Michailovna Kalmaeva was born in Minsk, the capital city of Belarus, in 1946. Her keen interest in painting at school determined her way in life. After school, L. Kalmaeva entered the Belarusian State Art and Theatre Institute, after 4 years study she went to Tallinn where she enrolled as a second-year student at the graphics department of the ESSR State Art Institute. Ludmila worked out her own principles and convictions. As years passed, Ludmila Kalmaeva was exhibiting, and her works attracted he public with their fresh and original artistic thinking as well as perfection of craftsmanship. L. Kalmaeva was invited to teach at the Belarusian Academy of Arts. For high achievement in her artistic and teaching work, Ludmila Kalmaeva was awarded the medal “For Labor Distinction” in 1986. A person has only one life… But if one moves to another country – there appears an opportunity to live another life ‘from scratch’. In 1991, on marrying Brian Tordoff, since 1992 she has lived in Middelburg, the Nederland. 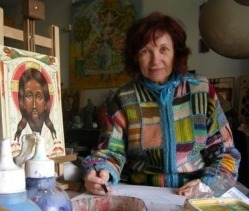 Some years after did L. Kalmaeva open the door of her own studio where she began to teach painting pictures and icons. Students of the “By the Windmill Studio" are adults and pretty wealthy, too. They consider fee-paying classes a good investment. Growing a creative seed in an ordinary adult is quite feasible. Ludmila Kalmaeva is convinced of it, having developed her own original system of teaching.